AP, or Advanced Placement, courses involve college-level material for high school, college-bound students. 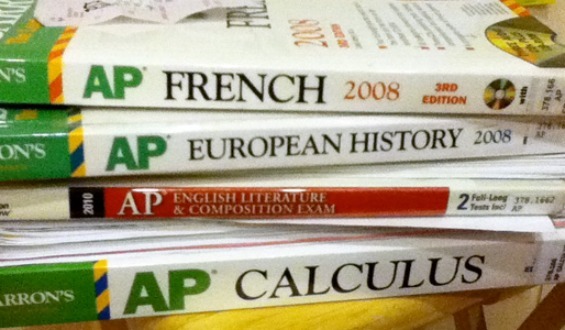 Not all AP courses, however, are weighted equally by colleges and universities. Some AP courses are better for college-bound students who are hopeful about getting college credit for work done in high school. There are usually two AP courses offered for calculus. If you can, take both of them. The first calculus course is what you can consider basic. If you find a good calculus teacher, you will be able to retain all of your information until you reach college, so that when you take the placement test, you do not have to repeat this “basic” course. Most colleges and universities will not take “full credit” for AP tests, although a score of 4 or 5 can get you into advanced classes. AP Biology is difficult, but if you can get through it, it will be worth it. Like AP Calculus, you probably won’t be able to receive full credit for your AP Biology test, even if it is a score of 4 or 5. Most colleges and universities are wary of the AP system, and will only take credit in exchange of taking another class to complete the requirements. For example, if you receive a score of 5, you may pass the initial test that the college gives you during orientation, but you may still have to take another biology course if you want to be a pre-med student. AP language classes are only useful in the sense that you may be able to bypass the foreign language requirements of your school. Some colleges and universities will ask you to take a test during orientation to place you. If you pass the test with flying colors, you will probably get all the credit that you need. If you don’t, but you still got the AP scores of 3 or higher, you will probably still get partial credit (though you will still have to take language classes). Although most colleges and universities don’t accept AP scores outright as complete college credit for their classes, they will accept them as “elective” credits. Even gaining elective credits can allow you to graduate early, letting you skip two or more semesters. The more AP’s you take, the more electives you’ll knock down. However, colleges and universities usually have a limit of 6 AP courses used for elective credit. Even if you aren’t college-bound, you should take AP classes because if you get a good teacher, you can still have a college experience even in high school.